This is the site for DaleyKlippings, an open source software package that helps you import your Kindle’s “My Clippings.txt” into other programs. The system can be customized to output files in a wide variety of formats. Early versions were developed with a particular emphasis on Evernote, but we plan to accumulate a variety of additional patterns in the program in our Export Patterns Category. The matching algorithm now uses locations and location ranges instead of dates when determining matches. This should significantly improve the accuracy of the matching process. When attaching a note, the algorithm automatically checks the highlight after and before the note. This expands support to Kindle devices (like the Touch) that list the notes before the highlights. Generally speaking, users should continue to use “Text” when creating export patterns because “Note” and “Highlight” will not always have data. In addition to the seven basic fields, DaleyKlippings supports a “Text” field that dynamically chooses between “Bookmarks” (empty), “Notes”, “Highlights”, and “Attached Notes” when filling in the field. 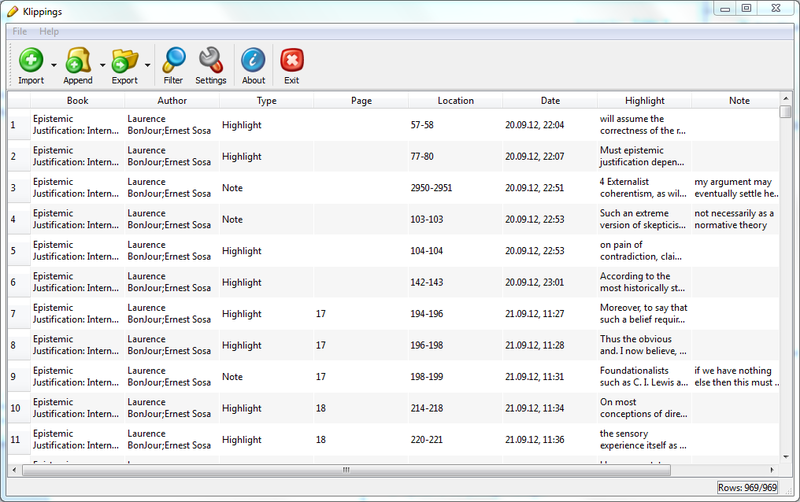 The output of Attached Notes is defined by a pattern box on each Export Profile. This field typically includes the Note and Highlight fields along with additional text or formatting. Ellipsis### and Truncate### – Enforces a maximum length for output (from the range 000 to 999). Both truncate data at the max length. Ellipsis also replaces the last three characters with “…” if it has been truncated. EvernoteTag – Enforces Evernote’s tag requirements by applying Truncate100CommaSafe to the associated field. I don't want to write. You don't want to read. Important information only!